The consentmanager.net pubvendors.json Manager allows your to easily manage the pubvendors.json file on your website - without the need to create codes or actually change the file every time you want to change something. Every time your business changes or you acquire new advertisers you will need to change your pubvendors.json file. That can be complicated an cause trouble or loss of revenues. 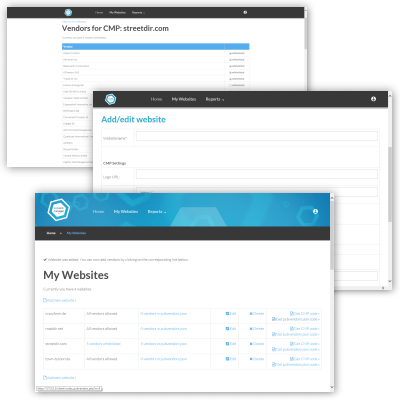 Our pubvendors.json Manager makes it easy for you to do this task: Simply login to your consentmanager.net account, setup your website(s), create the code and integrate it on your webserver. We also have a new WordPress Plugin which makes it even easier to integrate our tool into your website. All further changes to the file can then be done directly from our platform: It will keep the file up-to-date and make sure the file is IAB compliant. Once the tool is integrated, your partners can already access the pubvendors.json file and you will never again need to worry about it. In addition you will get detailed reports which show you how your pubvenors.json file is used. 1. Do I need pubvendors.json? Short answer: Probably yes. Long answer: If you are a publisher/website owner and place online adverting on your, the advertisers on your website will very likely collect and/or process personal data such as IP-addresses of your visitors. On the one hand the pubvendors.json file will allow you to define which company is allowed to process personal data. On the other hand you will be able to define the rules on which data may be processed: From what we see, there are very many vendors (advertisers/data processors) that rely on so called "legitimate interest" in order to collect data from visitors. Depending on the jurisdiction this can be invalid. Therefore you need to add a pubvendors.json file to your website in order to make sure that all advertisers only work on consent basis and not on base of legitimate interest. This will protect your own company. 6. Your question is missing here?